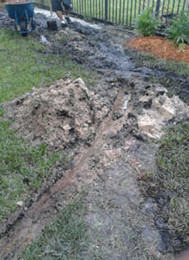 Drainage Work and Site Preperation - Universal Landscape, Inc.
Poor drainage not only is a mess, it can cause problems as many know not only with their landscape but also damage to a home or building. It can cause mold and mildew to grow in walls on the interior when the ground water sits and stays against the side of a home’s wall. It costs more with landscapes as plants, lawns and trees have shorter life spans because of weak rooting, as well as the costs to treat landscapes with increased levels of fungus, molds and insects that are attracted to weakened plant areas. Not to mention the mess in yards and surface areas. Good or poor drainage on a property is primarily a result of two main factors : 1) The contours of the property, the elevations and slopes and 2) The conditions of the soil, porous verses non-pourous soil. No matter the type of property or drainage problem, the solution always begins with a simple fact; water respects gravity and except when dealing with pump stations; it will flow, sit or collect always, as it is directed or allowed. The problem with drainage starts here. As in the photo to the right shows, the Stage of construction when the Boxblade and tractor work is being performed to grade a property, is when most mistakes occur. The community could have good or poor Engineering plans that were performed to Create problems or well running systems, but each residence or building in a development also plays a factor in how well that property will drain. If a community has a poor drainage plan, this makes it more difficult for the residences obviously as water has trouble leaving the surface and running off into swales, streams, ponds, lakes and city water systems as may apply. The fix may be more difficult in this situations, and the challenges will vary. To talk about specifics, if a neighborhood has at least a decent engineering plan for removing rainfall and storm surge water from a neighborhood, then the problem can be dealt with on a single property to find a resolution. Even if neighboring properties are dumping water during rains on your own, depending on the slopes of the lot, this usually can be handled on your lot, even with ‘uncooperative’ neighbors. The answers go from the simple to the more extreme, depending on the slope of the property again and the soil conditions. To start from more minor repairs and simpler fixes, take an area that may remain damp even in the drier times of year. Without ripping up the landscape and lawn, especially on smaller lots with homes that take up the majority of the property, this may be addressed first by catching and directing the roof water. Installing gutters is a good start. 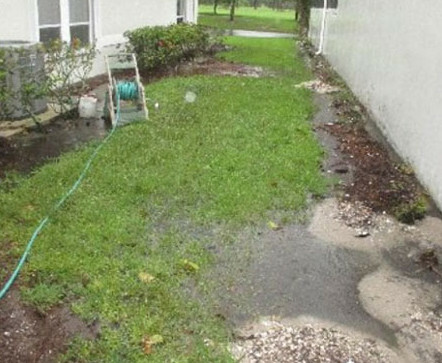 If you have gutters and are having this standing water or damp area problem, to the point that nothing will grow, the next step would be to try to solve the problem by collecting and directing as much water as you can, before attempting to regrade the property. PLEASE NOTE : It is a good idea to speak with a few different professionals and you should be able to tell from meeting with a variety of contractors or engineers, who may have more experience, and listening to different solutions as well. In the end, it is a straight forward problem, not complex to understand, and a common sense solution should be apparent the more you investigate your situation. Some may take the rip up the entire area as the first approach, which costs more money to fix, but I would suggest starting from the smaller approach and investigate if the less expensive fixes may solve the problem first. Not employing those least measure first strategies, but looking at the problem and escalating the solution as you investigate the solutions before you begin to have the work done. 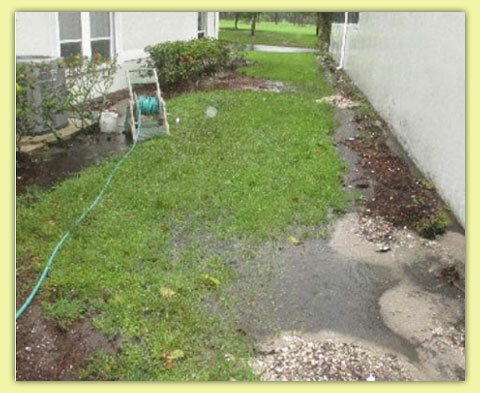 Residential Properties, fixing drainage problems; from simpler remedies to the more involved. 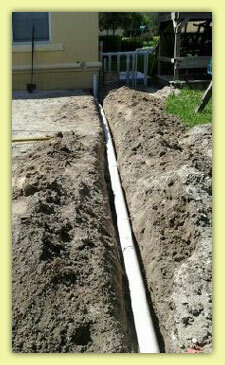 1) Installing gutters around the house. If not the whole house, at least the side(s) of the trouble areas. 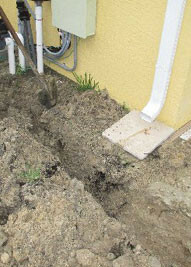 2) Connecting drainage piping lines (4″) to the downspout of the gutters and running that drainage piping to a place either close by away from the house and standing water area into an easement or directing it to the side, front or rear of the property where natural swales are to naturally be to help water escape between residential or commercial properties. The drainage piping is buried underground, usually at a slight decline in pitch determined by the size and slope of the property. Collecting the water that is collected in the gutters from the downspout points, and tying it into underground (4″) drainage piping will take a large amount of water that falls and direct it away from the water. Takes a large source of standing water away from the start. This may be enough for many properties. 3) Adding in Collection points in the property; French drains, etc. 6) Engineering in a runoff of into an existing community drainage waterway, street drainage sewers, or neighborhood collection piping (under streets) this requires a permit and a sealed plan from a certified civil engineer, and the approval & authorization of the local municipality in most cases. It involves the need first for a means to capture and / or collect a property’s water, (different approaches possible) and the need to discharge the water into a neighborhood or city water collection system, (typically under roadways at the end of a drive) directly. 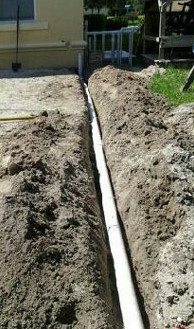 This is done by drilling into an existing system and connecting the drainage piping so that the water from your property can be disposed into the larger community drainage system. This requires the proper planning and permissions. For more information, you may contact your local planning and zoning authority, city or county for details in the process that will be applicable in the case where you live.